Because cars are designed with interchangeable parts, there is a significant risk that people may be tempted to steal cars or refashion and resell stolen automobile parts. To prevent this type of activity, the Legislature has made it illegal to buy or possess for sale vehicles or vehicle parts with altered vehicle identification numbers. Under California Vehicle Code Section 10803 VC, this is a serious criminal offense that can be charged as either a felony or misdemeanor and can ultimately result in significant prison sentences. The defendant bought or possessed for sale more than one motor vehicle or parts from more than one motor vehicle. 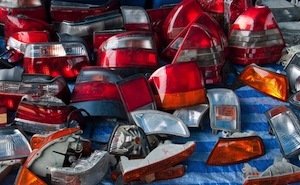 The defendant intended to resell, transfer or dispose of said motor vehicles or the parts from motor vehicles. The identification number of said vehicles or of the parts of a motor vehicle were intentionally defaced or destroyed. The defendant knew that the identification numbers have been intentionally defaced or destroyed. AND the identification numbers were defaced or destroyed for the purpose of misrepresenting the identity or preventing the identification of the motor vehicles or motor vehicles parts. A man owns an automotive repair shop. One day his parts supplier offers to sell him stolen parts for a significant discount. The supplier says that the parts are stolen and that all identifying information has been sanded off so they could never be identified as stolen. The shop owner agrees to purchase the parts in order to resell them to customers at a steep profit. The shop owner could be charged with buying and possessing for sale multiple vehicle parts with altered vehicle identification numbers in violation of California Vehicle Code Section 10803 VC. In another example, a man trades automotive parts for a living. He is pleasantly surprised to find a new supplier who has much lower prices than his competitors. The man is not aware of the fact that the man is providing him stolen parts featuring altered vehicle identification numbers. The man would not be criminally liable under California Vehicle Code Section 10803 VC in this scenario because he did have knowledge that the vehicle parts he possessed for sale had been unlawfully altered. As described above, if the defendant did not know the vehicle identification numbers of the motor vehicle or motor vehicle parts had been altered or defaced, he or she would not be guilty of this offense. Buying vehicles or motor parts with altered vehicle identification numbers or possessing these items for sale is “wobbler” offense that can be charged as either a felony or a misdemeanor. If charged as a felony, a defendant can be sentenced to up to four years in prison. For those charged with a misdemeanor, the maximum sentence is a year in jail with a minimum sentence of ninety days in jail. If you or someone you know have been charged with buying or possessing vehicles or motor vehicles parts with altered vehicle identification numbers, it is critical that you meet with a Los Angeles Criminal Defense Lawyer immediately. Los Angeles Criminal Defense Attorney Michael Kraut is a former Deputy District Attorney with over 14 years of prosecutorial experience who knows how best to defend those charged with offenses like this. For more information about buying or possessing for sale vehicles/parts with altered vehicle identification numbers, and to schedule your free consultation, contact Los Angeles Criminal Defense Lawyer Michael Kraut at the Kraut Law Group located at 6255 Sunset Boulevard, Suite 1480, Los Angeles, CA 90028. Mr. Kraut can be reached 24/7 at 888-334-6344 or 323-464-6453.